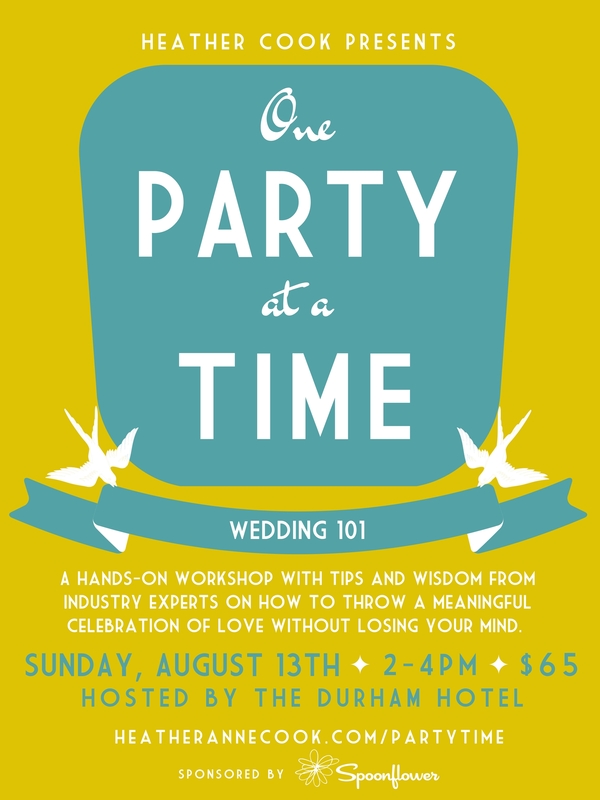 For all the recently engaged who want to throw a beautiful Durham wedding without losing your mind: we’re partnering with Heather Cook presents One Party at a Time: Wedding 101. In this two-hour workshop, attendees will be lead through a work session on crafting custom wedding ceremonies and have the opportunity to ask questions of a panel of experts about coordination, catering, styling, hair and make-up, photography and decor. Also, River Takada-Capel of Rivtak Handmade will partner with Spoonflower to lead a DIY workshop on creating custom textile decor for your wedding. Guests will also have the opportunity to tour the hotel and learn about wedding offerings. Guests will receive a comprehensive planning notebook created by Heather Cook and Bound Custom Journals complete with resources experts, helpful planning guides and a recommended vendor list for all things wedding. Following the workshop, attendees are invited to join the panelists for an informal happy hour on the roof for more follow-up conversation.